Are you striving to help your business soar to new heights with the Toshiba e-Studio 656 copier? Well, you have come to the perfect place! 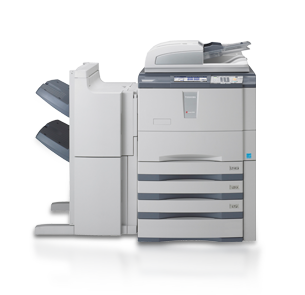 Arizona Copiers has the most expansive inventory of Toshiba models in the entire industry. Whether you are looking to purchase, rent, or lease the copier, we will work with you to provide the best situation to meet your business needs and financial budget. Since we understand the value of this investment, our company guarantees to find the most amazing discounts available and deliver your brand-new copier in flawless condition. At Arizona Copiers, we are not happy unless our customers are completely satisfied with their copy buying experience. Please do not hesitate to give us a call at 602-428-5885 for more information or to answer any questions you may have. Outfitted with some of the most high-tech features in the industry, the Toshiba e-Studio 656 has everything your business needs to maintain a solid infrastructure to your operation. It boasts an incredibly fast output print speed of 65 pages per minute in either color or black and white, as well as a first time copy rate of just 4 seconds. Plus, the machine is warms up and is ready to go within 130 seconds every morning, so there will be no time wasted. With the innovative e-Bridge technology and CCD line sensor, the laser electronic copier is capable of high-speed scanning in a breeze. When customers complain about replacing paper and toner cartridges in their copier, the Arizona Copier company always recommends the Toshiba e-Studio 656. This Toshiba model completely eliminates the hassle of fiddling with the unit to replace these items often. Its maximum paper supply of 7,600 sheets ensures that there is enough paper to potentially last the office months, depending on the amount of document traffic. In addition, the black toner yields an impressive 73,900 impressions for long-lasting use. When the cartridge is empty, the machine automatically sends an alert signal on the easy to read display screen. The user can then replace the cartridge immediately in a matter of moments without the need for any special assistance. In order to stay ahead of competition and lure in some new customers, take advantage of the wide array of finishing options that this unique Toshiba model can handle in a flash. From stapling and hole punching to creating saddle-stitch booklets and pamphlets, the possibilities are endless with this easy to navigate copier. Whatever options you shall decide on, the end product will always be perfectly crisp and sharp with a high-quality 2400×600 dpi resolution. Buy, Lease, or Rent the Toshiba e-Studio 656 Today! Arizona Copier is the leading company in the copier business that is able to provide the flexible options for obtaining this high-quality copier at a discounted rate. With more than twenty years in the business, we have become dedicated to providing the best customer service and longest-lasting warranties to protect your purchase. Please call us immediately at 602-428-5885 to obtain all of the tremendous features of the Toshiba e-Studio 656 for your growing business!